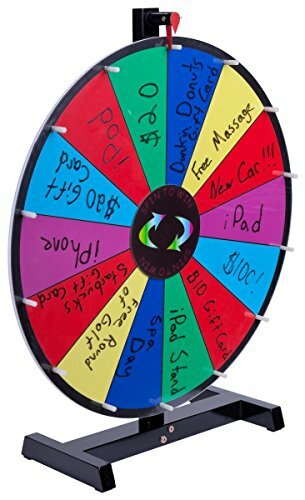 Build drama and excitement by spinning this 24-inch diameter tabletop promotional prize wheel. When spinning, the plastic clacker and pegs make a loud, recognizable clicking sound. There are 14 slot sections with a gloss acrylic write-on surface so that they can be customized each and every time the game is played. Use with dry erase, wet erase and liquid chalk markers. The wood stand has rubber footing to prevent shifting when in use and the included carrying bag makes it easy to transport this prize wheel. Dimensions: Overall: 24"w x 27-1/2"h x 8"d Base Counter: 15-3/4"w x 8"d Wheel Diameter: 24" Weight: 7 pounds. Comes with carrying case making it easy to transport. Wood stand has rubber footing to prevent shifting when spun.